Although it is fact that new moms are among the top most distracted drivers in the country, it is also true that mothers of multiple children can become just as distracted as new moms, especially when it comes down to those road trips. Of course the idea of family vacays are wonderful, but let’s face it, they can be extremely long, and yes while family bonding time is the best time, it may not always go as smoothly as you dreamed it to be. You’re not alone. Mommies, we’ve all been there before. The destination ahead of you, while the kids bicker behind. The big debate: One Direction vs. The Wanted. Your six-year old asks repeatedly in the most intonation voice, “Are We There Yet?” while the youngest one screams in sheer agony for that 2pm feeding. The worst part, 90 miles left to the next rest stop. Enough to make any parent rethink the idea. However, all can go really well if you take a few extra moments and develop a plan that will lessen your stress, causing you to focus more on the road. So for starters, make a checklist. Hey most of us have a ‘To Do List’ on a daily basis, so why not make one for the road? Aside from your luggage, maps and/or GPS, don’t forget your emergency car kit, which can come in handy in the event of the unfortunate. But, when traveling with children, you’ll want to make sure that you have plenty of distractions to keep them entertained while you navigate through the open roads. Snacks and beverages are a must! Hungry kids aren’t the happiest kids. Growling bellies lead to complaints and whines, which lead to growling mommies. Especially with little ones under the age of five, prepare bottles, treats and schedule your rest stops according to feedings and diaper changes. No one, including baby wants to be around if you don’t. Trust me! Furthermore, one of the absolute most important things you need to have on your road trip is…entertainment! A bored child will surely let you know, and without anything to do, they will begin to ask you every question under the sun, making a one-hour trip seem like a cross country adventure. 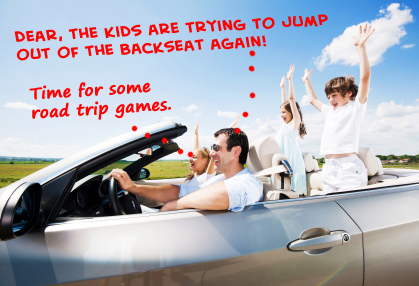 However, when packing games for the road, make sure the activities you bring along don’t create so much noise that your children distract and hinder the driver. So we thought we’d share with you five of our favorite travel games to keep your little ones entertained…and you alert. Happy Traveling! Rock, Paper, Scissor: a classic game for all ages, but most importantly, doesn’t require any board games or small pieces to pack. Your hands are all you need to enjoy hours of fun! Memory: choose a name that begins with any letter of the alphabet. The next player has to repeat the previous name, followed by a new name of choice, beginning with the same letter, and so on to the next player. With so many topics and letters to choose from, you could literally spend the entire trip engulfed in this game. I Spy: who doesn’t love a good game of I Spy? One person chooses an object around them. He or she then gives the other people in the car a clue by saying: “I spy with my little eye, something…” until the object is named. One of the best travel games ever! Spelling Bee: parents can get involved in this one too! Not only will your child have a fun time spelling, but they will also enjoy learning new words in the process. The Banana Game: a pretty simple game, but tons of fun! The color yellow is a rarity in vehicles, so be the first person to spot a passing yellow automobile. The more you see, the more points you’ll receive. The person with the most points wins.